Stun Guns are electroshock weapons that are used in subduing persons through the administration of an electric charge and have the capacity to disrupt superficial muscle functions. There are many types of electroshock weapons including Stun Guns, Tasers, Stun Batons and Flashlight Stun Guns. Act Now and get Huge Saving during our Stun Gun Blowout Sale! Stun Guns are a reasonable less lethal self defense weapon for people seeking to defend themselves. 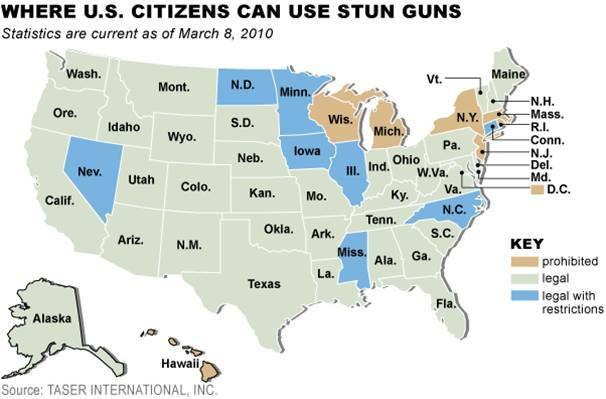 Several States and Cities ban Stun Gun devices arguing that they aren't protected by Second Amendment Rights. But several recent court cases and lawsuits have argued that some states go too far in banning stun guns as a self defense alternative. DISTRICT OF COLUMBIA: Illegal District of Columbia Law. DC Code Ann. Title 6, Chapter 23. Firearms Control. Subchapter I. General Provisions 6-2302. (7) "Destructive device" means: (B) "Any device by whatever name known which will, or is designed, or may be readily converted or restored, to expel a projectile by the action of an explosive or other propellant through a smooth bore barrel, except a shotgun." (D) Any device designed or redesigned, made or remade, or readily converted or restored, and intended to stun or disable a person by means of electric shock. Subchapter II. Firearms and Destructive Devices. General Provision 6 2311. Registration requirements: (a) Except as otherwise provided in this chapter, no person or organization in the District of Columbia ("District") shall receive, possess, control, transfer, offer for sale, sell, give, or deliver any destructive device, and no person or organization in the District shall possess or control any firearm, unless that person or organization holds a valid registration certificate for the firearm. Subchapter V. Sales and Transfer of Firearms, Destructive Devices, and Ammunition. General Provision 6 2351. Sales and transfers prohibited. No person or organization shall sell, transfer or otherwise dispose of any firearm, destructiv device or ammunition in the District except as provided in *** 6-2352, or 6-2375. SUMMARY: Possession and sales of Stunning Devices are banned in Washington, DC. sale, hold for sale, sell, give, lend or deliver any electric gun. (b) Any electric gun in violation of subsection (a) shall be confiscated and disposed of by the chief of police. SUMMARY: Possession and sales of Stunning Devices are banned in Hawaii. MASSACHUSETTS: Illegal Massachusetts State Law. Ann. Laws of Massachusetts. Chapter 140. Sale of Firearms. Section 131J: Sale or possession of electrical weapons; penalties. Section 131J. No person shall sell, offer for sale or possess a portable device or weapon from which an electric current, impulse, wave or beam may be directed, which current, impulse, wave or beam is designed to incapacitate temporarily, injure or kill. Whoever violates this provision of this section shall be punished by a fine of not less than five hundred nor more than one thousand dollars or by imprisonment for not less than six months nor more than two years in a jail or house of correction, or both. SUMMARY: Possession and sales of Stunning Devices are banned in Massachusetts. MICHIGAN: Illegal The Michigan Penal Code Act 328 of 1931. Chapter 750.224a Portable device or weapon directing electrical current, impulse, wave, or beam; sale or possession prohibited; testing. (1) A person shall not sell, offer for sale, or possess in this state a portable device or weapon from which an electric current, impulse, wave or beam is designed to incapacitate temporarily, injure, or kill. (3) A person who violates this section is guilty of a felony. SUMMARY: Possession and sales of Stunning Devices are banned in Michigan. Stun guns. Any person who knowingly has in his possession any stun gun is guilty of a crime in the fourth degree. SUMMARY: Possession is banned of Stunning Devices in New Jersey. NEW YORK: Illegal New York Consolidated Law (McKinney?s) Book 39. Penal Law. Article 265. Firearms and Other Dangerous Weapons 265.00 15-a. "Electronic dart gun" means any device designed primarily as a weapon, the purpose of which is to momentarily stun, knock out or paralyze a person by passing an electrical shock to such person by means of a dart or projectile. 15-c. "Electronic stun gun" means any device designed primarily as a weapon, the purpose of which is to momentarily stun, cause mental disorientation, knock out or paralyze a person by passing a high voltage electrical shock to such person. Article 265.01 Criminal possession of a weapon in the fourth degree. A person is guilty of criminal possession of a weapon in the fourth degree when: (1) He possesses any firearm, electronic dart gun, electronic stun gun ***; or *** SUMMARY: Possession is banned of Stunning Devices in New York. RHODE ISLAND: Illegal General Laws of Rhode Island. Title 11, Chapter 47. Statute Subsection 11-47-42. Weapons other than firearms prohibited. - (A) No person shall carry or possess or attempt to use against another, any instrument or weapon of the kind commonly known as a *** stun gun ***. Any person violating the provisions of this subsection, shall be punished by a fine of not more than five hundred dollars (0), or by imprisonment for not more than one (1) year, or both such fine and imprisonment, and the weapon so found shall be confiscated. SUMMARY: Possession and use of Stunning Devices are banned. WISCONSIN: Illegal Wisconsin Sta. Ann. Chapter 939. Crimes - General Provisions. Chapter 939.22 Words and phrases defined. (10) Dangerous weapon" means any firearm, whether loaded or unloaded ***; any device designed as a weapon and capable of producing great harm ***; any electric weapon, as defined in s. 941.295(4); or any other device or instrumentality which, in the manner it is used or intended to be used, is calculated or likely to produce death or great bodily harm. Chapter 941.295 Possession of electric weapon. Subsection (1) On or after July 1, 1982, whoever sells, transports, manufactures, possesses or goes armed with any electric weapon is guilty of a Class E felony. Subsection (4) In this section, "electric weapon" means any device which is designed, redesigned, used or intended to be used, offensively or defensively, to immobilize or incapacitate persons by the use electric current. SUMMARY: Possession and sales of Stunning Devices are banned. BALTIMORE: Illegal (Including Baltimore County) Baltimore City Code 115. Stun guns and similar devices. (e) It shall be unlawful for any person, firm, or corporation to sell, give away, lend, rent or transfer to any individual, firm or corporation a stun gun or other electronic device by whatever name or description which discharges a non-projectile electric current within the limits of the City of Baltimore. It further shall be unlawful for any person to possess, fire or discharge any such stun gun or electronic device within the City. Nothing in this subsection shall be held to apply to any member of the Baltimore City Police Department or any other law enforcement officer while in the performance of his or her official duty (Ord. 385. 1985). HOWARD COUNTY, MD: Illegal Sec. 8.404. Sale or possession of electronic weapons prohibited. It shall be unlawful for any person, firm, or corporation to sell, give away, lend, rent or transfer to any individual, firm or corporation an electronic weapon within the limits of Howard County. It further shall be unlawful for any person to possess, fire, discharge or activate any electronic weapon within the limits of Howard County. (C.B. 38 1985). NEW YORK CITY: Illegal Administrative Code of the City of New York 10-135 Prohibition on sale and possession of electronic stun guns. a. As used in this section, "electronic stun gun" shall mean any device designed primarily as a weapon, the purpose of which is to stun, render unconscious or paralyze a person by passing an electronic shock to such person, but shall not include an "electronic dart gun" as such term is defined in section 265.00 of the penal law. b. It shall be unlawful for any person to sell or offer for sale or to have in his or her possession within the jurisdiction of the city any electronic gun. c. Violation of this section shall be a class A misdemeanor. [Exemptions under this section are provided for police officers operating under regular department procedures or guidelines and for manufacturers of electronic stun guns scheduled for bulk shipment. NOTE: The electronic stun gun is not a "firearm" under the Federal Gun Control Act of 1968 because it does not "...expel a projectile by the action of an explosive..."] SUMMARY: Possession and sales of Stunning Devices are banned in New York City Montgomery County, MD - no stunners. We can legally sell to you, but please note the limitations. CONNECTICUT: Legal w/ restrictions Connecticut Criminal Law Title 53 ? Crimes, Title 53a ? Penal Code, title 54 Criminal Procedure, Chapter 950 Section 53a-3 Definitions: (20) "Electronic defense weapon" means a weapon which by electronic impulse or current is capable of immobilizing a person temporarily, but is not capable of inflicting death or serious injury. §53-206. Carrying and sale of dangerous weapons Any person who carries upon his person? an electronic defense weapon, as defined in 53a-3, or any other dangerous or deadly weapon or instrument, unless such person has been granted a written permit issued and signed by the first selectman of a town, the mayor or chief of police of a city or the warden of a borough, authoring such person to carry such weapon or instrument within such city or borough, shall be fined not more than five hundred dollars or imprisoned not more than three years or both. No permit shall be issued to any applicant who has ever been convicted of a felony. The issuing authority may request the applicant?s finger prints and full information concerning his criminal record and make an investigation concerning his criminal record and make an investigation concerning the suitability of the applicant to carry any such weapon. Refusal of fingerprinting by the applicant shall be sufficient cause to refuse issuance of a permit. Whenever any person is found guilty of a violation of this subsection, any weapon or other implement within the provisions hereof, found upon the body of such person, shall be forfeited to the municipality wherein such person was apprehended, not withstanding any failure of the judgment of conviction to expressly impose such forfeiture. Any person who has been granted a permit to carry any martial arts weapon pursuant to this section may carry such weapon anywhere within the state. The provisions of this subsection shall not apply to any officer charged with the preservation of the public peace nor to any person who is found with any such weapon or implement concealed upon his person while lawfully removing his household goods or effects from one place to another, or from one residence to another, nor to any person while actually and peaceably engaged in carrying any such weapon or implement from his place of abode or business to a place or person where or by whom such weapon or implements is to be repaired, or while actually and peaceable returning to his place of abode or business with such weapon or implement after the same has been repaired. (b) any person who sells to another? electronic defense weapon, as defined in section 53a-3, shall, within 24 hours after the deliver of such weapon or implement to the person to whom sold, give written notice of such sale or delivery, specifying the article sold and the name and address of the person to whom sold or delivered, to the chief of police of the city, the warden of the borough or the first selectman of the town, within which such weapon or implement is sold or delivered, as the case may be. Any person who violates any provision of this subsection shall be fined not more than one hundred dollars. SUMMARY: Section 53-206(a) prohibits the carrying of a Stunning Device on the person unless that person has obtained a dangerous weapons permit. However, there are no state-wide permits, only local permits ? the permit is only good in that particular town and would be illegal elsewhere. Anyone selling such a weapon must notify the chief of police with that information within 24 hours of the delivery. Therefore Stunning Devices can be sold and it can be kept in your place of business or home, but you cannot carry it on your person without a permit which is only good within the limits of the city in which it was issued. ILLINOIS: Legal with conditions (Illegal in Chicago) Illinois State Law. Compiled Stat. Ann. Chapter 430. Public Safety ACT 65. Firearms Owners Identification Card Act. Chapter 720. Criminal Law and Procedure, Article 24. Deadly Weapons. 5/24-1 Unlawful use of Weapons. (A) A person commits the offense of unlawful use of weapons when he knowingly: **** (8) Carries or possesses a firearm, stun gun or Taser or other deadly weapon in any place which is licensed to sell intoxicating beverages, or at any public gathering held pursuant to a license issued by any governmental body or any public gathering at which an admission is charged, excluding a place where a showing, demonstration or lecture involving the exhibition of unloaded firearms is conducted; or (9) Carries or possesses in a vehicle or on or about his person any pistol, revolver, stun gun or Taser, or firearm or ballistic knife, when he is hooded, robed or masked in such a manner as to conceal his identity; or (10) Carries or possesses on or about his person, upon any public street, alley, or other public lands within the corporate limits of a city, village or incorporated town, except when an invitee thereon or therein, for the purpose of the display of such weapon or the lawful commerce in weapons, except when on his land or in his own abode or fixed place of business, any pistol, revolver, stun or Taser or other firearm. A "stun gun or Taser," as used in this paragraph (a) means (i) any device which is powered by electrical charging units, such as batteries, and which fires one or several barbs attached to a length of wire and which, upon hitting a human, can send out a current capable of disrupting person?s nervous system in such a manner as to render him incapable of normal functioning or (ii) any device which is powered by electrical charging units, such as batteries, and which, upon contact with a human or clothing worn by a human, can send out a current capable of disrupting the person?s nervous system in such a manner as to render him incapable of normal functioning. (b) Sentence. A person convicted of a violation of Subsection 24-1(a)(8) and Subsection 24-1(a)(10) commits a Class A misdemeanor; a person convicted of a violation of Subsection 24(a)(9) commits a Class 4 felony. (c)(2) A person who violates Subsection 24-1(a)(9) in any school, regardless of the time of day or the time of year or residential property owned, operated and managed by a public housing agency or on the real property comprising any school, regardless of the time of day or the time of year or residential property owned, operated and managed by a public housing agency or any conveyance owned, leased or contracted by a school to transport students to or from school or a school-related activity commits a Class 3 felony. School is defined as any public or private elementary or secondary school, community college, college or university. Article 24 5/24-1.1 Unlawful Use of Possession of Weapons by Felons or Persons in the Custody of the Department of Corrections Facilities. Section 24-1.1. Unlawful Use of Possession of Weapons by Felons or Persons in the Custody of the Department of Corrections Facilities. (a) It is unlawful for a person to knowingly possess on or about his person or on his land or in his abode or fixed place of business any weapons prohibited under Section 24-1 of this Act or any firearm ammunition if the person has been convicted of a felony under the law of the State or any other jurisdiction. This section does not apply if the person has been granted relief by the Director of the Department of State Police pursuant to Section 10 ***. Article 24 5/24-2 Exemptions (i) Nothing in this Article shall prohibit, apply to, or affect the transportation, carrying or possession, of any pistol or revolver, stun gun, Taser, or other firearm consigned to a Common Carrier operating under license of the State of Illinois or the Federal Government, where such transportation, carrying, or possession is incident to the lawful transportation in which such Common Carrier is engaged; and nothing in this Article shall prohibit, apply to or affect the transportation, carrying or possession of any pistol, revolver, stun gun, Taser, or other firearm, not the subject of and regulated by subsection 24-1(a)(7) or subsection 24-2(c) of this Article, which is unloaded and enclosed in a case, firearm carrying box, shipping box, or other container, by the possessor of a valid Firearm Owners Identification Card. SUMMARY: Possession of a Stunning Device is unlawful when in corporate limits of a city or incorporated town, school, in any place licensed to sell intoxicating beverages, at any public gathering held pursuant to a license issued by any governmental body or any public gathering at which an ] admission is charged, or when a person?s identity is concealed. Possession is legal when on a person?s land or in his own abode or fixed place of business in Illinois. CITY RESTRICTIONS: OHIO: LYNN COUNTY/CEDAR RAPIDS: Any stun gun in public requires the user to have a concealed weapons permit. By literal translation, Capt. Schwartz (ph: 319-398-3911) states that technically, this includes even "snowballs" and "Stunning Devices" NOTE: Stunning Devices can be used, however, in the place of business or at home.